The Institute of Forest Genetics and Tree Breeding (IFGTB) is a national Institute established in April 1988 under the Indian Council of Forestry Research (ICFR). A multi-faceted research Institute primarily aimed to carry out research to improve productivity of forest tree species through conventional breeding programmes and biotechnological interventions. Mainstream research carried out by the Genetics and Biotechnology divisions is supported by Silviculture, Seed technology, Protection (Entomology & Pathology), Agro-forestry and Bio-diversity divisions. 4. 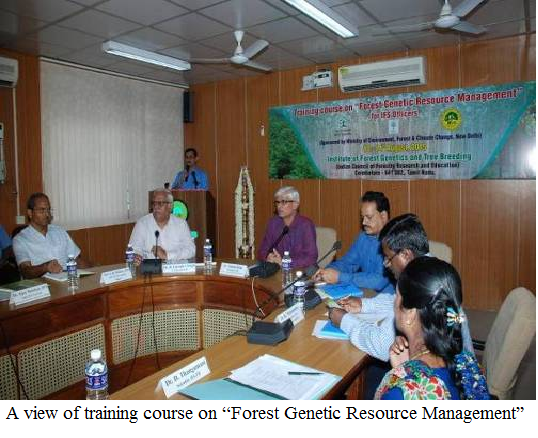 To develop and manage forest genetic resources (FGR) for conservation and sustainable utilization. 5. To undertake research for development of mitigation and adaptation strategies in forestry sector to meet the challenges of climate change. 6. To undertake biodiversity and ecological assessments for development of site specific conservation strategies, restoration and rehabilitation of degraded and fragile eco-systems. 7. 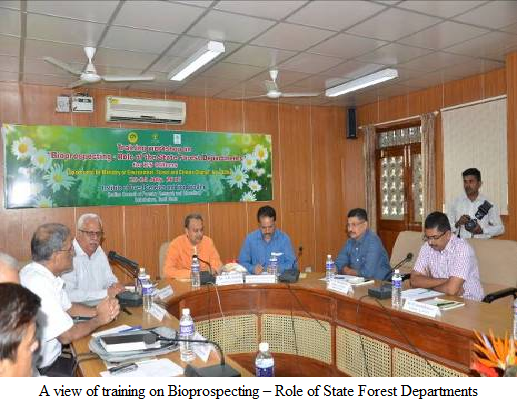 To carry out research for development of eco-friendly products for various applications through bio-prospecting for sustainable use of forest resources. 8. To develop extension strategies to increase the accessibility and affordability of improved varieties and other products and conduct socio-economic studies including market research, economic valuation and other related aspects. 9. To undertake research and knowledge management on various aspects of forests, viz., forest soils, invasive species, forest fires, insect pests and diseases and restoration and rehabilitation of degraded and fragile ecosystems. 10. To provide technical assistance and material support to states, forest dependent communities, forest based industries, tree & NTFP growers and other stakeholders in their forestry based programmes for conservation and sustainable use of forest resources. 11. To develop, upscale, disseminate and share appropriate technologies to end-users through innovative extension strategies and capacity building programmes. a) - Licensing of Fast Growing Clones Released by IFGTB: IFGTB has so far released 30 clones of Casuarina and Eucalyptus with superior characters like fast growth, wind - hardiness, drought tolerance, insect attack tolerance and ability to grow in sodic soils. The intellectual property right for these clones is protected through registration with the Protection of Plant Varieties and Farmers’ Rights Authority (PPVFRA), Government of India under the provisions of Protection of Plant Varieties and Farmers’ Rights Act, 2001. The new clones are capable of producing 25 to 40% more pulpwood compared to the currently planted benchmark clone depending on the planting site and cultivation practices adopted. The wide adaptability, fast growth, pest tolerance and uniform growth of the clones help the farmers to realize the maximum potential of land and the crop. Through increased wood production, these clones also improve the pulpwood raw material availability for the paper industries which currently face acute shortage of fibre raw material. b) - IFGTB has developed inter-specific hybrids of eucalypts to exploit hybrid vigour for economically important traits such as pulp yield, lignin/cellulose ratio and adventitious rooting potential and field evaluation trails are in progress for releasing to farmers and paper industries. 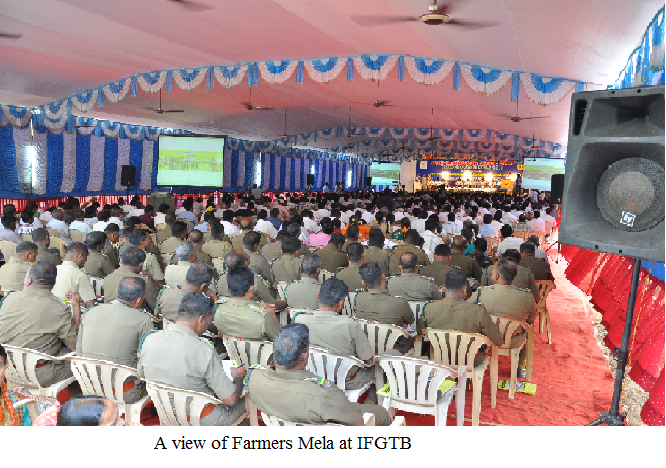 c) - IFGTB has established state-of-art clonal propagation facilities and producing large number of plants of newly released clones and being supplied to farmers. In particular Eucalyptus camaldulensis clone, IFGTB-EC 4 and Casuarina junghuhniana clone, IFGTB-CJ 9 have become popular among farmers and paper industries and the area of cultivation with these clones is steadily increasing. Farmers get a minimum of 30% more wood production from these clones which gradually replacing he currently planted commercial clones. Developed and standardized seed handling techniques for 15 Shola species and a book entitled, "Seed Biology and Bio-Inoculants for Shola Tree Species- A Field Guide" (Solai Vana Marangalukkana Vidhai Uyiriyal Matrum Uyir Urangal – Oru Kalappani Kaiyedu) in Tamil was brought out as an outcome of the project for use by foresters. Established 2 shola restoration trials – one at Kotagiri (1 ha) and other at Glenmorgan (1 ha) to study the effect of bioinoculation on performance of shola species. Biopesticides -Vilvekam (Bael, Aegle marmelos seed oil based formulation) was developed and released in the year 2011. 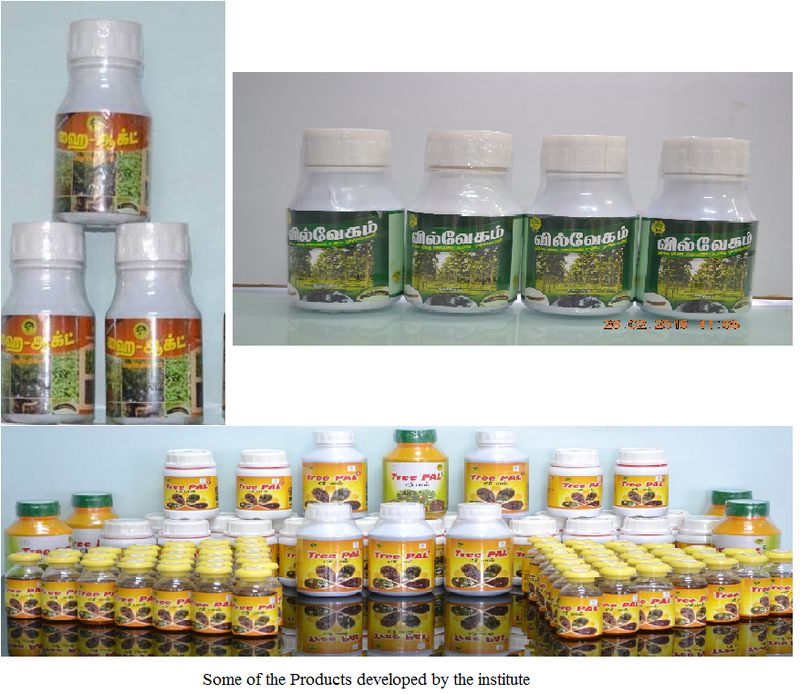 Hy-Act – Biopesticide-Hydnocarpus pentandra seed oil based preformulated biopesticide against teak defoliator Hyblea purea, casuarina bark eating caterpillar Inderbela quadrinotata and ailanthus defoliator Eligma narsisuss was developed and released in the year 2012. Tree PALH a new biopesticidal product of seed oil based formulation developed from Hydnocarpus pentandra was released during “Tree growers Mela February, 2013” at Institute of Forest Genetics and Tree Breeding, Coimbatore. Tree rich biobooster” using ecofriendly organic materials for growth improvement of fast growing trees species such as Casuarina, Gmelina, Ailanthus, Melia and Eucalyptus has been developed and introduced during “Tree growers Mela February, 2013” at Institute of Forest Genetics and Tree Breeding, Coimbatore. f) - Insect pest problems of Acacia nilotica ssp. indica, Albizia lebbeck, Casuarina, Tectona grandis, Tamarindus indica, Azaditrachta indica, Phyllanthus emblica, Pongamia pinnata, Syzygium cumini, Ailanthus excelsa and Aegle marmelos were studied and integrated methods of management of the key pests worked out. A Pest Calendar reflecting the period and level of occurrence of the key pests of the said tree species has been developed. g) - The laterite soils generally lack beneficial microbes and N, P, K were successfully reclaimed in forest areas in Kerala using the tree species inoculated with VAM and Azospirillum Phosphobacterium. 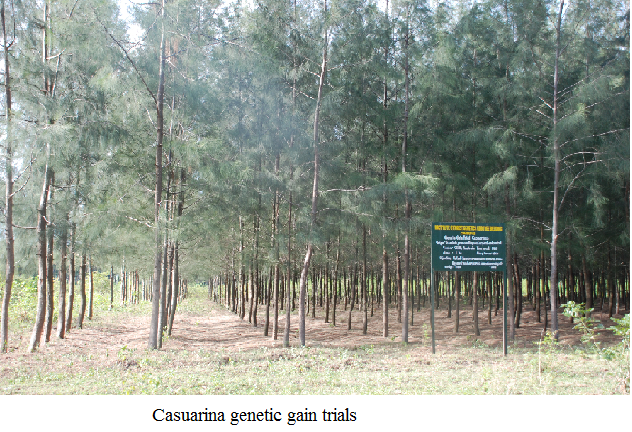 a) - Five superior clones of Casuarina junghuhniana were developed for windbreak agroforestry systems and Variety Release Committee (VRC) of ICFRE approved during March 2014 for the release based on the recommendation of Regional Variety Testing Committee (RVTC) of IFGTB. These released clones were mass multiplied and used to establish demonstration plots of Windbreak agroforestry system as well as being supplied to several needy farmers. So far, 25000 ramets (planting stocks) of these five windbreak clones have been supplied to the farmers/stakeholders. Around 50 ha of area has been covered under windbreak clones of IFGTB. 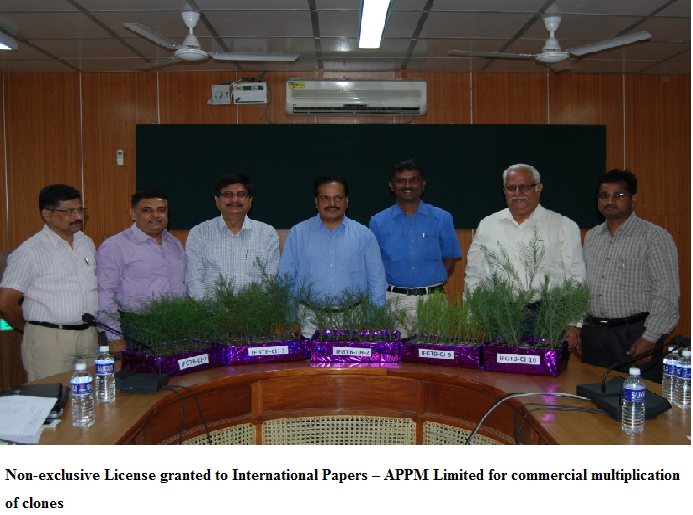 b) - Industrial collaborations were strengthened and projects supported by the Indian Paper Manufacturers Association and Department of Biotechnology on seed orchard development for pulpwood species and commercial propagation of Red Sanders have been implemented. c) - Windbreak agroforestry system with Casuarina on either side of teak trees row was developed for minimizing branchiness and enhancing height increment, as teak being a strong light demander species, when teak trees are grown in bunds as a single row, height growth of teak is stunted and heavy branchiness expressed on the main stem. This technology was transferred to a farm in Coimbatore district during this year using the windbreak clones released by IFGTB. d) - IFGTB-VVK-KVK Meet: IFGTB convened a meeting with the Krishi Vigyan Kendra (KVK), Van Vigyan Kendra (VVK) and College of Forestry (COF) at KVK Thrissur, Kerala on 16 December 2016. The programme coordinator KVK Dr A. Prema, DFO Social Forestry, Shri A. Jayamadhavan, Dr T.K. Kunhamu Professor and Head, Silviculture and Agroforestry COF participated in the meeting. A team of 7 Scientists led by the Director IFGTB, Shri. R.S. Prashath IFS deliberated during the proceedings. e) - One day training workshops for the farmers on the cultivation and management of tree species held one each at Coimbatore, Trichy, Tindivanam and Killilkulam. f) - As an alternate source of livelihood support, training on technology and development of biobooster (alternate to soil potting mixture/ growth promoter) was transferred to Irular tribes in forest fringe villages of Coimbatore Tamil Nadu. g) - The ENVIS Centre on Forest Genetic Resources and Tree Improvement observed the International Day of Forests on 21st March 2016 at IFGTB. Shri. R.S. Prashanth, Director IFGTB released an awareness poster based on the theme of the year 2016, ‘Forests and Water’ in the presence of Group Co-ordinator Research and all Heads of Divisions. The Director emphasized the responsibility of every individual to protect the existing forest cover which is the major source of fresh water. The function concluded with the planting of tree saplings by the dignitaries. h) - The Science Express Climate Action Special (SECAS) was stationed at the Palakkad Railway Station in Olavakkode, Kerala on 22.03.2016 and 23.03.2016. During the two-day exhibition, Team members from the ENVIS Centre on Forest Genetic Resources and Tree Improvement participated and associated with the event organizers as part of creating awareness to school, college students and public. Information boards were placed for display in the platform highlighting the following major components. The institute is one of the nodal centre for FRI Deemed University and so far 58 Ph.D students have successfully completed their Ph.D degree and six are pursuing their Ph.D.
IFGTB has also been recognized by the Bharathiar University, Coimbatore to have Ph.D. programmes in Botany, Plant Biotechnology, Microbiology, Zoology and Life Sciences. Presently 27 candidates are pursuing for Ph.D. in the Institute and four candidates were awarded Ph.D.
To motivate the Under Graduate Engineering & Technology and Post Graduate Life Science students to pursue research in forestry and allied sciences the institute has initiated a student’s research program under this during the last three years about 80 students have completed their dissertation work. Supplied quality seeds of Casuarinas, Eucalypts, Tectona grandis, Gmelina arborea, Melia dubia, Azadirachta indica, Sapindus emarginatus, Santalum album and Pongamia pinnata (35.495 kg) to various user agencies and generated revenue of Rs.3.40 lakhs to the Institute. Under the NRDMS-DST project on “Transfer of products/technology on biobooster to Irular tribes in forest fringe villages of Coimbatore, Tamilnadu: An alternate source of livelihood support“ (NRDMS-DST, New Delhi), the following tribal hamlets were selected from forest fringe villages at Palamalai, Paraliyar and Pillur in Coimbatore district. Explained them about the product developed by IFGTB, Tree Rich Biobooster- and its utility in Forestry and Agriculture. The product will be transferred to tribal group for livelihood improvement. Under Direct to Consumer Scheme, a plant volatile based insect Trap (EuGalLure) for Eucalyptus gall wasp control in eucalyptus nurseries and plantations was prepared for supplying to stakeholders like forest departments, paper industries, farmers raising eucalyptus plantations. Gall susceptible but productive clones can now be brought back by stake holders by deploying this trap in nurseries, plantations, farm and agroforestry trials. A Product VAM Bio-fertilizer (IFGTB Tree Growth Booster) for Quality Seedling Production in Tree Nurseries was mass produced and made available to all the user groups (Farmers, Tree growers, College Teachers, Students, NGOs, SFDs, etc.) on different occasions during the year. Development of low cost DNA isolation kit (Direct to Consumer Scheme of ICFRE): A low cost spin column based DNA isolation kit was developed and validated in tree and crop species. Third party validation was also conducted and DNA QC report was generated. An MTA was signed with Biozone Research Technology Pvt. Ltd., Chennai, for testing the kit for future licensing. 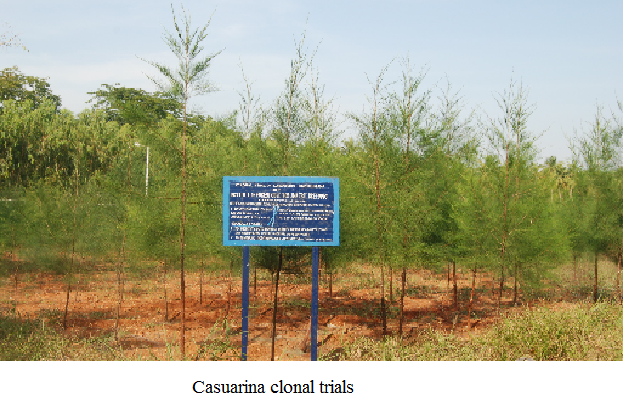 CASUARINA YIELD CALCULATING UTILITY SOFTWARE (CYCUS): The institute developed a farmer’s friendly software for yield assessment in the plantation of Casuarina. A free mobile “app” on “Tree Pests of India” has been released containing information insect pests, their description, damage caused and symptoms and their managements strategies of 25 important tree species of India. 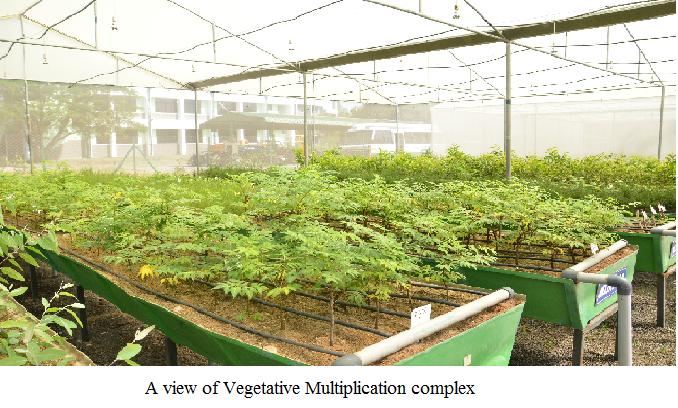 Improved planting stock of teak was mass multiplied through micropropagation. A demonstration trial of teak has been laid out at Trichy. Planting material has been supplied to farmers generating revenue of ~ 3 lakhs. A Training Workshop on Urban Forestry on 25.11.2016 was organized at IFGTB, Coimbatore. About 100 participants attended the training. The participants were teachers/coordinators of the National Green Corps and Eco-clubs of schools, the officials of forest department, NGOs and residential associations. National Workshop on "Important Timber Trees of India – seeking solutions towards Country's timber deficit" was organized on 9-10 February 2017 at IFGTB, Coimbatore. Dr. S. Kedharnath Memorial Lecture (KML-2016) in memory of the contributions made by Dr. S. Kedharnath to Forest Genetics and Tree Improvement Research in India was organized on 23 December 2016. The 5th edition of Dr.S.Kedharnath Memorial Lecture (KML-2017) was conducted in IFGTB, Coimbatore, on 28th July 2017. Dr.Ashok Kumar Bhatnagar, Former Head and Professor of Botany, University of Delhi delivered the lecture on “Declining Pollination and Seed Dispersal Relationships Affecting Biodiversity and Progeny Fitness of Forest Species”.